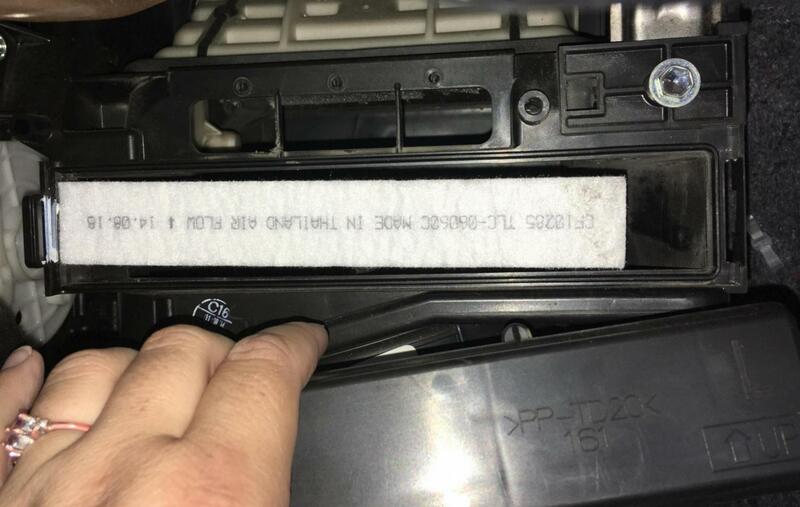 I’m replacing my cabin filter in my 2015 Corolla LE and want to make sure the arrow on the filter should be facing up. I just put in a new Fram fresh breeze filter CF10285 and the words are upside down but the arrow is facing up. Is that correct? See pic. Yup, that should be correct. The air flow goes upwards so as long as the arrow on the filter is pointing up, you should be fine. From owners manual - and your pic. Do you see the gap on the side, is that normal? Yeah, that space is normal. If you look closely, it's not really a gap but it's a small space that doesn't have any air holes. I guess it's to help align the filter. Since we are on the topic of air filters and cabin filters, do y'all have the part numbers for the two? Looking to replace both and will probably purchase them on Amazon. 2014 Toyota Corolla S Plus 6 Speed Manual. I get my stuff oem from online store of dealerships. Thanks but they want $19 for shipping? To those with carbon activated filters. Do u put the charcoal on the top or on the bottom? I put mine on top side. On my air purifier at home, the charcoal filter comes first then paper after. That link was Toyota dealer online in TX. Try and find one on the west coast, but not in CA (so you won't have to pay sales tax). If you buy a lot of stuff at once time, and get from a nearby online dealer, the shipping is not much per item. That arrow is not indicating the direction of air flow, it is indicating how to orient the filter. Air comes in from the cowl, above the filter. You can always tell the airflow direction by seeing which side of the filter has the crud (leaves, grass bits, etc.) on it. So do u put the charcoal activated side on the top or bottom?